The party wall surveyors Act enables a building owner to undertake work within the scope of the Act and unless an adjoining owner consents to the works, the act sets out a procedure whereby the matter is referred to surveyors for determination by Award. 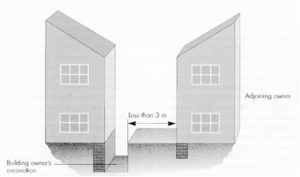 The Party Wall Act 1996 is intended to provide a framework for preventing and resolving disputes in relation to party walls, boundary walls and excavations near neighbouring buildings. The Act provides a fair solution to the problems that are frequently encountered when building on or adjacent boundaries or in confined areas. The Act also covers “party structures” which include walls, floors or other partitions between parts of a building in separate ownership. Does the Act affect the ownership of a Party Wall? No, but in many cases the Act will prevent disputes arising in the first place. The Party Wall Act provides a building owner, who wishes to carry out various sorts of work to an existing party wall, with additional rights going beyond ordinary common law rights. The Act also provides that a building owner must not cause unnecessary inconvenience. Although the Act contains no enforcement procedures, starting work without serving a notice could mean your neighbour could seek a court injunction or other legal redress. An adjoining owner cannot stop someone from exercising their rights given to them by the Act, but may be able to influence how and at what times work is undertaken. Adjoining owners should note that the primary purpose of the Act is to facilitate development. Under the Act, notice must be served and if agreement cannot be reached, surveyors may be appointed. If agreement cannot be reached between neighbouring parties, the process is as follows: A Surveyor or Surveyors is/are appointed to determine a fair and impartial Award, either: An ‘Agreed Surveyor’ (someone acceptable to all parties), or two surveyors representing both property owners. The two surveyors will nominate a third surveyor who would be called in only if the two surveyors cannot agree. In all cases, surveyors appointed under the dispute resolution procedure of the Act to draw up an award must behave impartially and consider the interests of both neighbours. The surveyor (or surveyors) will prepare an “award” (also known as a “party wall award”). This is a document which: sets out the work that will be carried out, says when and how the work is to be carried out (for example, not at weekends if the buildings are domestic properties), records the condition of next door before the work begins (so that any damage can be properly attributed and made good), allows access for the surveyors to inspect the works while they are going on (to see that they are in accordance with the award). The surveyor (or surveyors) will decide who pays the fees for drawing up the award and for checking that the work has been carried out in accordance with the award. The owner undertaking the construction is made legally responsible for putting right any damage caused by carrying out the works, even if the damage is caused by his contractor. Although minor works on a party wall are usually considered to be too trivial to come under the remit of the Act, the key point to be considered is whether any planned work will have consequences for the structural strength and support functions of the party wall.